The stylish Palm Springs Yacht Club cultivates a country club atmosphere with nautical touches by Jonathan Adler. The moment you walk through the doors of Palm Springs Yacht Club (PSYC), located on the sprawling, perfectly manicured grounds of Parker Palm Springs, you are instantly transported to the dreamiest spa destination. 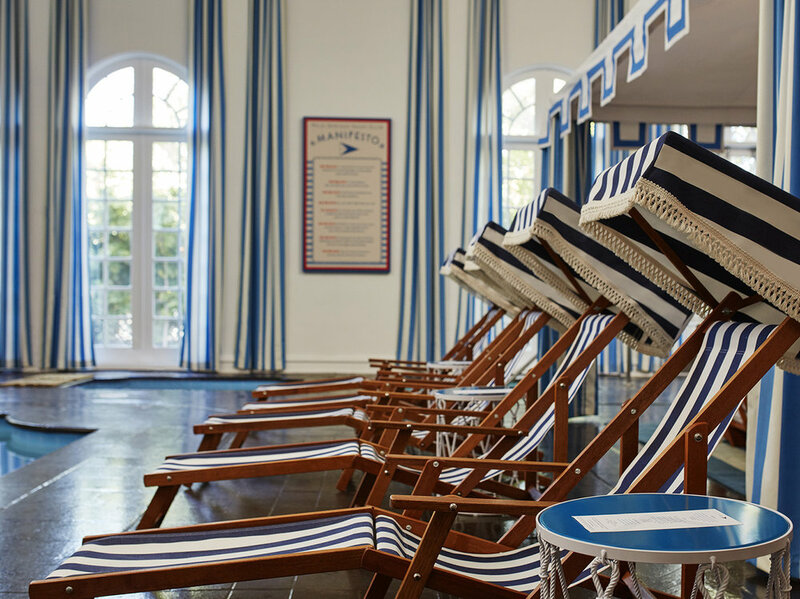 Featuring a charming country-club atmosphere with stylish nautical decor and unique accents from designer Jonathan Adler, PSYC is the ultimate wellness getaway that offers premium pampering. The 18,000 square-foot spa offers a variety of relaxing sea-inspired therapies, all featuring fun and innovative names like Ahoy Mate! and Yachtsman’s Voyage. From couples treatments and body scrubs to sipping a British cocktail while enjoying the scenery from your reclining deckchair—there is something for everyone to enjoy in this special slice of paradise. We believe the earth is three-quarters water, and your body is three-quarters water, and this is purely coincidence. We believe in good sports as well as fitness; Pétanque and Pastis, Pimm’s Cup and croquet, snooker and single malt whisky. The Spa has an indoor saline swimming pool. Key Features: Palm Springs Yacht Club offers a place where no guest ever chooses to leave from. It a free standing-emporium of custom treatments and wellness regimens. Complimentary yoga classes, movement studio, fitness center, hot tubs, saunas, eucalyptus steam rooms, relaxation areas, and an indoor saline swimming pool. And that does not even include the 17,000 square-feet of space that is dedicated to amazing spa services they offer. Bonus: Well….don‘t tell everyone, but all our guests indulging in spa services receive a complimentary shot of cucumber-infused vodka! Insider’s Tip: Our services are a full 60 minutes, whereas most spa’s services only last 50 minutes. We believe in you getting all the time you need and deserve. Guests are served complimentary cocktails while lounging in a poolside tent. Snacks Served: We offer fresh infused waters, healthy snacks, and for those wishing to dine with us during their trip, we offer a full-service food and beverage menu that you can enjoy by our indoor pool. Unique Treatment: Our signature treatment is the Tailor Made Massage, where our guests can customize their experience according to their individual needs. The charming nautical-themed lounge at Palm Springs Yacht Club. Splurge Treatment: For anyone looking to spend the day with us, I would always suggest one of our “Daily Excursions.” Although my favorite one is the Perfect Potion—it allows you complete pampering from head-to-toe, literally. This excursion includes a 60-minute Tailor Made Massage, 60-minute Pore Cleansing Facial, and a Manicure and Pedicure. Insider’s Favorite: That depends on the day, but I’m a big fan of the Matriarch Facial, since it offers facial cupping and the results are amazing. Although I have to say that our Hot Stone Massage is also just as nice. Featured Products: Tata Harper is our exclusive skin care line and we use organic products from Grateful Desert.